Give your newlywed friends the perfect gift with this wine carrier. 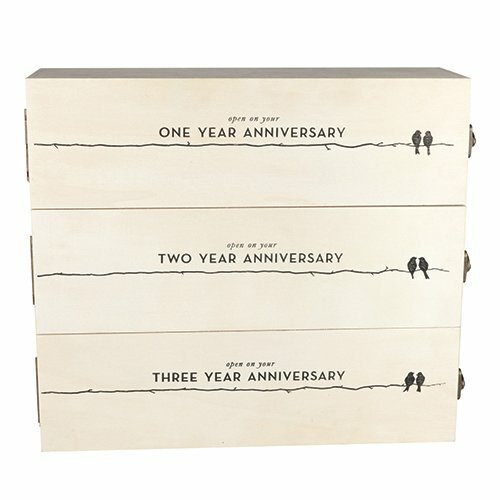 A beautiful pine box holds 3 standard sized bottles of wine, one for each of their first three anniversaries. The compartments are kept shut by brass latches and faux leather accents. This is one of the most unique wine gifts you can give. Simply fill the box with 3 great bottles of wine and they’ll be enjoying it for many years. Give the perfect gift with the Boulevard Newlywed’s Anniversary Wooden Wine Box by Twine. Celebrate new love with vintage wine. Our 3-tiered pine wood Newlywed's box is the gift that keeps on giving. Just stock it with fine wine and the lovely couple will be ready to celebrate their anniversary for years to come.